Prater’s Lump Breaker is designed to provide a simple, more economical means of reducing compacted materials into smaller, granulated product required for most processing or packaging lines. 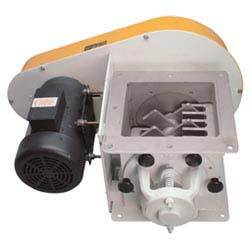 The Lump Breaker improves product flow for a variety of applications including: sugar, salt, chemicals, cereal, kiln dust, resin, pigment, filter cake, pasta, fertilizer and more. This equipment can be used to reduce natural agglomeration, which can occur during storage/shipping, or reduce material deliberately compacted in densification processing or in recycling or waste disposal applications. View/print Lump Breaker product information document here.